Aimee Hyatt grew up in a home where there were always animals to love. Her passion for animals began as a little girl when her mother brought home their first pet, a Persian cat whose name was Jasmine. This was just the beginning of all the pets that were going to enter into Aimee’s life. Growing up in the city of Philadelphia, Aimee doesn’t remember a time when she didn’t have a cat, a dog, a rabbit, a duck, or a fish in there home. Following her formative years in Philly, Aimee moved to California, settling down at Shapiro/West, (a personal management & production company), working behind the powers that be on “Seinfeld”. Aimee likes to say that she was trained and educated by “the best in business”, George Shapiro & Howard West. The hectic and stressful workload led Aimee to the practice of yoga. Her very first teacher was the renowned Micheline Berry; she remembers when Micheline told her that yoga was going to change her life. Aimee couldn’t imagine this being possible at the time, but Micheline proved to be right. Aimee’s life changed in a big way, forever. Before Aimee’s first yoga teacher training at YogaWorks in Los Angeles, she received her Certification in Human Massage from IPSB, a school of holistic body therapy and massage. Still, it would be a while before Aimee did her first yoga teacher training. During this time, there was a cat that Aimee had rescued; it sadly died from a terminal illness. While saddened by this terrible loss, it didn’t stop Aimee from rescuing her dog, Shayna. it was at this time that Aimee began practicing yoga with “a dog”, but she didn’t put much thought into it; it just felt natural and calming to her. Everything seemed to be on track: Aimee was preparing to do her teacher training, and she was loving her life with her rescue pup, Shayna. Shayna had a sister, Ruby, who lived in Malibu a good part of the time. It was 2003: this one day in Malibu would permanently change Aimee’s life; it would disrupt everything she was aiming for. Ruby was standing on the beach while Shayna hesitantly went down the stairs, but stopped short because of her fear of the other dogs. In that moment, Shayna decided to turn around to make her way back up the stairs to safety when she lost her footing. All that Aimee remembers is locking eyes with her Shayna one last time before she dropped through the stairs onto a rock. Aimee screamed, and went into shock; the people on the beach rushed over to help as Shayna was rushed to the hospital where her vet, (and close friend), allowed Aimee to sleep with Shayna at the hospital. Shayna had passed away 4 days later, and Aimee was never the same; she didn’t think about yoga, trainings, or anything for a long time. Her world was shattered as she played the moment over-and-over in her mind thinking how she could’ve saved Shayna in that moment. It was clear that PTSD had set in, deeply. Ruby had done her own suffering during this time. She had lost her “human mom” to breast cancer, and she had seen her “canine sister”, Shayna, pass in front of her. Things were about to change for the better for this little girl. Enter Rosie. George Shapiro gave Aimee just what she needed: her Rosie. There was no way Aimee could be sad when she looked into this little puppy’s face. Ruby made sure that Rosie knew who was the boss! Aimee needed to laugh again, and she did this alongside Rosie & Ruby by designing a line of canine & human dog tees: Shaynamania aka K9sRock. Aimee would come up with the names of K9 rock bands which were inspired by the real bands, laughing hard as the names would tickle her. After getting legal permission, Aimee made: Spayed in the USA, Concert for the fixed with the Canine Inch Nails and the Red Hot Chili Puppies, and many, many more. Aimee noticed that something was off with Rosie’s behavior. She rushed the little puppy to the hospital and was told she had a heart murmur. It was Aimee’s dear friend and breeder, Marilyn Mayfield, who urged Aimee to get Rosie to the well-known cardiologist, Michael Lesser. Dr. Lesser performed surgery on Rosie within just a couple of days. Diagnosis: Rosie had a pda (patent ductus arteriosus), a congenital heart defect in dogs. Aimee was numb with fear, and certainly couldn’t handle another loss. Rosie is a rock star!!! With a strong Spirit and luck, Rosie pulled through the surgery; you never would've known that she had gone thru such a scary surgery at all. She's my hero! Aimee still takes her dogs to Dr. Lesser today. Aimee needed to get back to her yoga. This time she went right into a teacher training at YogaWorks; back to the teachers that she knew and loved. These were very long days and many hours of studying. At the end of each training day, Aimee would run home to Rosie and Ruby just wishing they could be in class while she trained. Sounds funny, but it’s true. This didn’t stop Aimee from doing an additional 300-hr. Teacher Training on top of the 200-hr. she had just done. Once these trainings were behind her, Aimee needed to figure out what she wanted to do with her practice and trainings. Aimee began to google yoga with dogs, and found a yoga instructor in Seattle who was teaching other instructors how to teach yoga in a studio environment with dogs. The teacher was, Brenda Bryant who wrote a book called: Barking Buddha: Simple Soul Stretches for Yogi and Dogi (paperback 2009). Aimee bought a plane ticket and spent a week in what George Shapiro called: “Aimee’s Heaven.” Aimee cried when she read these words because she knew they were true. Aimee flew back to Los Angeles knowing that if she wanted to teach yoga with dogs, she needed to learn more “about dogs”, not yoga. Aimee enrolled herself (and Rosie & Ruby) into the Ojai School of Animal Massage Therapy. This is where Aimee first learned about physical therapy with dogs, and canine acupressure. Once Aimee received her Certification in Animal Massage Therapy, she then met what she calls her “furever teacher”, Kim Bauer. Aimee did her canine acupressure studies with Kim through the Tallgrass Animal Acupressure Institute, and continues to learn from Kim whenever she visits Oregon. Kim now teaches at the Northwest School of Animal Massage. Aimee felt ready and confident to embark on her new journey with Rosie and Ruby, her co-pilots. (2015): Aimee went to a playdate with Rosie & Ruby at place called Healthy Spot, a pet retail and grooming location where they inspire a healthy lifestyle for your pet. “Everything at Healthy Spot resonates with my beliefs”: good health equals happiness, good nutrition, community, giving back, rescue, and a great play date area for the dogs! Aimee reached out to them to see if they would entertain the idea of her trying to teach doga to their clientele. 3 years later, Aimee has built a healthy following and relationship with a company she loves and believes in. DOGAFIT was born! 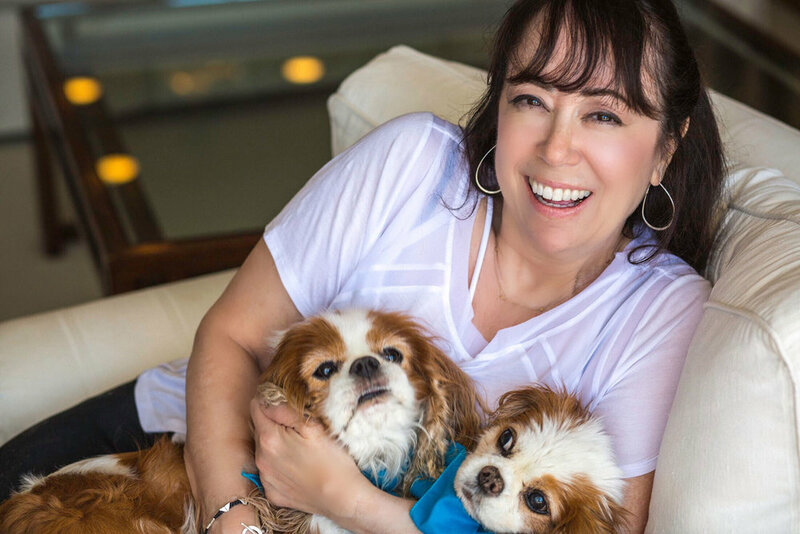 It’s been 3 years since Aimee began her teaching journey of Yoga with Dogs, which includes other modalities that Aimee got Certified in as well: Canine Massage Therapy, Acupressure & Reiki I & II. Aimee is currently teaching her classes in Los Angeles at Adopt & Shop , The David Lynch Foundation: Women’s Initiatives, in Hollywood, Birchbark Foundation, and other Foundations throughout California and beyond. Aimee is a true believer in the power of holistic mind/body health and wellness for all dogs, as well as their humans.